Mudras are symbolic hand gestures, and they are seen in all statues of the Buddha and Bodhisattvas, and are often seeing in different representations of various Hindu gods and goddesses. In Buddhism, the mudras are associated with particular Buddha poses (also known as an asana or attitude), and how the hand is held can signify the difference from one pose to another (or from one Celestial Buddha to another in the Mahayana and Vajrayana traditions). While Hindu deities are often depicted holding weapons, Buddhism believes in abstaining from violence and not causing harm to other beings, following the principle of "non-harm"(ahimsa). Because of this aversion to violence, it was considered offensive to depict Buddhist deities holding weapons. Hence, specific hand poses are used primarily in Buddhist art to convey the attributes that would have been demonstrated by weapons in Hindu art. In a limited number of instances, Buddhist deities can be seen holding weapons. The Bodhisattva Manjusri, for instance, slices through ignorance with the Sword of Wisdom, held in the right hand. Bhumisparsha Mudra : This is the Touching the Earth hand gesture, also known as Calling the Earth To Witness. Right hand hanging down, palm facing inward, while the right arm rests over the right knee. The Buddha's fingers are extended but flexed slightly, with the tips of the fingers touching the ground (or nearly touching it). The left hand rests in the lap face up, and an alms bowl may or may not be present in the left hand. 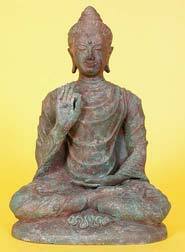 This mudra is common to Gautama Buddha (the Historical Buddha) and also to the Dhyani Buddha Akshobhya. Varada Mudra : Similar to the Bhumisparsha Mudra mentioned above, the Varada Mudra differs in that the palm of the right hand is facing outward from the body and toward the viewer of the statue. This gesture means that the Buddha or other deity is either receiving an offering or granting a boon. 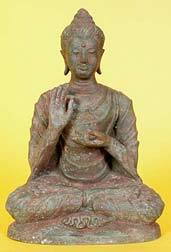 This gesture is common to both Shakyamuni Buddha and to the Dhyani Buddha Ratnasambhava. Again, an alms bowl may be present in the left hand without changing the meaning of the gesture, however, if there is a bowl with herbs and a blooming flower in it, and the right hand holds the stalk of a myrobalan plant between the thumb and index finger, then the image specifically depicts the Medicine Buddha of the Mahayana School of Tibetan Buddhism. Dhyana Mudra : Hands resting upon each other in the lap. This is the gesture of meditation, and this hand gesture can occur in concert with the single lotus pose (one crossed leg resting on top of the ankle of the other leg), or in the double lotus pose (where the ankles are tucked in above one another). the elbows are bent and point outward toward the sides (as opposed to the elbows pointing backwards behind the image). Again, an alms bowl is sometimes depicted as well, but not always, and the presence of an alms bowl does not change the meaning of the statue. This gesture is also known as the Samadhi (concentration or meditation) mudra, and is associated with the Amitabha Dhyani Buddha. Dharmachakra Mudra : The Buddha taught his followers that reason and discernment were critical to achieving enlightenment. Hence, when the right hand is held upward with the thumb and finger touching, and both hands are held at chest level, the the arms slightly bent. This particular gesture is known as Turning The Wheel of the Law, as the word Dharma means "way of nature" and Chakra means "wheel" or "universe." This gesture represents the time of the first sermon taught by the Buddha at Sarnath. One famous representation of this moment is at the cave temple at Ellora, India, which was believed to have been carved during the 7th century of the common era. 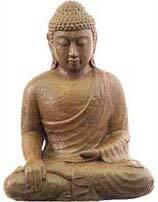 In the Dhyani lineage, this gesture is associated with Vairocana Buddha. Abhaya Mudra : This is the gesture of reassurance (Abhaya translates as "without fear"), but it is also associated with protection, and can be seen in sculptures that depict the Hindu God Vishnu, the protector of the universe. The right arm is slightly elevated, and is bent at the elbow. The right hand is held with the fingers pointing upward, and the palm faces outward toward the viewer. In Thailand, this gesture is often known as haam yaat (restraining relatives) and is associated with the Sukhothai Walking Buddha Statues. The reason it is called restraining the relatives is because of the belief that, by simply raising the hand in this one gesture, the Buddha was able to stop a feud that was starting to get out of control amongst an extended family. Another story tells of how the Buddha was able to stop an elephant from charging by simply lifting up the right hand. This is the gesture of the Amoghasiddhi Buddha in the Vajrayana school. Vitarka Mudra : This is often translated as the gesture of argument, but might better be thought of as the gesture of discourse or discussion. Similar to the Jnana Mudra, the thumb and index finger of the right hand touch one another. However, in the Vitarka gesture the right hand is raised, with the elbow bent, and the palm faces outward toward the viewer. The remaining fingers of the right hand are extended upwards, although slightly flexed. Tarjani Mudra : This gesture is made by holding the right hand vertically in front of the chest, with only the index finger raised while the other fingers and thumb make a clenched fist. The outer edge of the palm (the pinkie side) faces outward toward the view, while the thumb-side of the palm faces inward to the deity. This is a gesture of warning, or can be thought of a hand sign of expelling demons or illusion. This gesture is made by the wrathful gods in the Vajrayana tradition. Jnana Mudra : Is the gesture of knowledge, and might be one of the most well known mudras to Westerners, as it is commonly performed when Westerners meditate or practice yoga. The tip of the thumb and index finger of the right right hand lightly touch one another, making a chakra (circle shape) between the two. 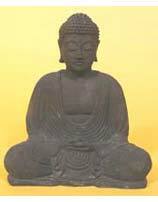 When the Buddha is depicted, the right hand is held at chest level with the palm facing inward. When someone meditating performs this gesture, the hands are place on top of the knees of their crossed legs, with the palms of the hands facing the opposite knee, or turned inward slightly. The elbows then point backwards behind the practitioner. "From the two other images shown, it appears to be the Buddha in the "stone position," with His face in hands. In other descriptions of this, it has been described as, "the Buddha weeping." Had never seen this before." "One of my favorite Buddha mudra is Bhumisparsha mudra. 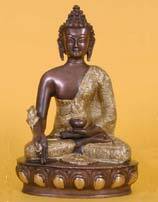 It is said that Lord Buddha after attaining Enlightenment use this mudra to summon Earth God." "Can anyone explain this pose? I was trying to find a corresponding mudra. I appreciate the help!" 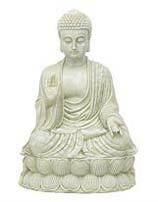 "I was recently gifted a Buddha for my serenity zone in my garden. A lady standing tall, right arm bent at the chest, hand aloft with thumb and second finger touching. The left arm points diagonally to the right across the waist with hand pointing downwards. Can anyone shed some light on this on for me please?" "I want to know what the pose of buddha in single lotus with his left hand over the lap and the right hand lift facing left means. "Can you tell me what a Buddha that is standing with right hand up and the left hand on its stomach with a bag in its hand means?"